Stuffed Squash, Baked Ravioli and the Elusive “Eat” Post – Travel. Garden. Eat. I had good intentions when I started this blog. Visions of a weekly travel-related post, a garden-related post, and a food-related post. I think that lasted a week. The blog then degenerated into Kat’s Blog o’ Babble — but, hey, I’m having fun with it, so that’s all that matters, right?! Food is one of my loves, though — integral to the travel experience and part of many of our best memories of time spent with family and friends (as I noted in my post regarding our 20-year dinner club tradition). It’s not that I don’t want to blog about food, it’s just that I am at the stage of life that most nights we are lucky if we find ourselves all seated around the dinner table at the same time. Some weeknights we have a progressive dinner theme, eating in stages and “courses” throughout the evening, to accommodate varying work and activity commitments. Moreover, since my husband is the primary cook in the house, I am not routinely cooking with camera in hand (even when I do cook, the camera is not usually part of the process) — and if I would hover with camera in hand while he cooked, our 20+ year marriage would not endure. This past weekend, my husband found a recipe for stuffed squash on a blog called “The Dirt.” When he told me the source of the recipe he adapted (by adding some bread crumbs, garlic, sweet Italian instead of regular sausage), I excitedly exclaimed, “I follow that blog!” This exciting discovery of another mutual interest after 20+ years together was lost on my husband. 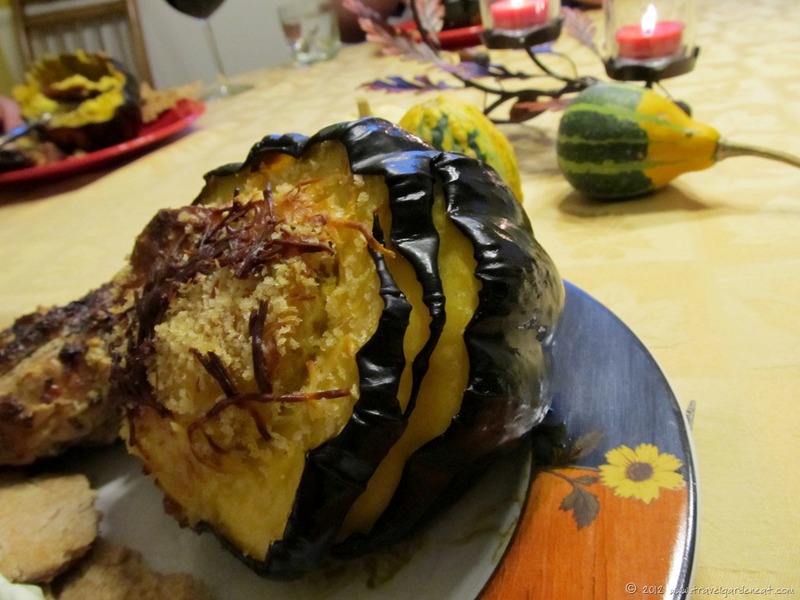 As he pulled the stuffed squash out of the oven, they screamed “food-related blog post”! (I, for some reason, am the only family member who heard their plea.) I dashed upstairs to grab my camera, and carefully turned my plate, trying to capture the lovely autumnal dish in the most favorable light. We even had set the table, in anticipation of a leisurely family dinner. Notice my husband’s half-eaten squash in the background? It gives you some idea of how long I fussed over the photo. This is why “Eat” is an elusive post. As I lamented the fact I had not taken a picture of the golden-brown, cheese-topped bubbly pasta dish when it came out of the oven, my husband looked at me, puzzled, and said, “just post the photo from the recipe’s website.” (Did I mention my husband doesn’t even read my blog, let alone follow other food blogs on a routine basis?) I looked at him in horror, and whined, “I CAN’T do that!” He wisely did not ask me to explain. This is why “Eat” is an elusive post. I wish I would be a good cook. I can cook some basic stuff my grandma and mother teached me. Typicall german stuff but its still not so great like they can cook. They can cook everything after reading a recept nevermind from which country the recipe is. Hard or easy recipes.. they can do all. Also the husband of my mother.. he is perfect in cooking. But that is something I am not good at. Your husband seems to be a great cook! Always on the lookout for a good squash recipe – will try this one! You have company in the blog performance anxiety area; but – you are blogging, writing, eating (yay), taking pictures and making us laugh… What I wonder is where people find so much time to post/read other blogs/enter challenges? Tethered is a good word – blogging does become integral and I try to fit blogging in in much the same ways but am still amazed at the amount of great and interesting content that some are able to generate… I always feel that I could be doing more or saying more while still trying to work it into all the other things that need to be done on a day-to-day basis…. Love the photos (both!) and the recipes — now I have more ideas for the cooking arsenal! And your comments on why “EAT” is such an elusive post. Both recipes look amazing. As a functional vegetarian, I’m always looking for ways to successfully adapt recipes–nuts and dried fruits instead of sausage, for example. We had an abundant basic crop this year, so I have lots of frozen pesto on hand. Thanks for posting these! Oh, Kat, you’ve made my day. 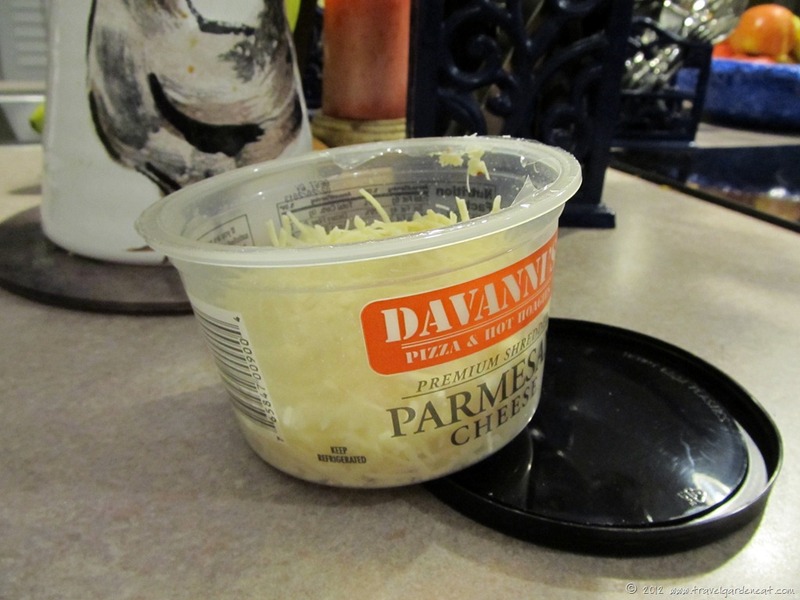 First with the spot-on humor and then with the ravioli-gratin recipe, which I am making use of TODAY. LOL re. your reaction to your husband’s comment. Blog’s evolve with time, don’t they? And isn’t that what’s fun about them?